In front of a sold-out home crowd of 3,091, the Maine Red Claws opened the newly-renovated Portland Expo for their inaugural season. The crowd was boisterous, the team was clicking, and Portland got to see a big win for the new team as they rolled over the Springfield Armor 102-79. Head Coach Austin Ainge got his first win in his home arena - and again his father was there watching in person. 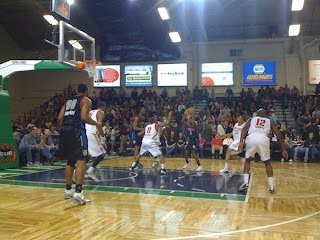 The Red Claws were in much better form than in the one preseason game barely two weeks ago. The new players acquired by the team in their flurry of moves seemed to be fit in relatively well, especially given that some hadn't even played a game with the Claws yet. It was clear that the Claws had improved dramatically since the preseason while the Armor had gone in the opposite direction. Indeed, despite being a relocated rather than an expansion franchise, the new Springfield team has started the season 0-3, while the Claws are now 2-1. Despite the final 21-point margin, the game was close for much of the evening. At the half the Claws were only up by seven points, and the Armor came out of the gates strong, keeping the margin close in the third. The team played with an impressive level of energy. They have perhaps bonded on the recent road trip, finally becoming a real team rather than just a collection of players. It was clear from the outset why Alexis Ajinca was the first player sent to Maine by the Charlotte Bobcats. Although certainly a defensive force with 13 rebounds, the rest of his night left a bit to be desired. He took some unnecessary risks with his shooting, but I expect to see him improve over the course of the year - if he works hard and listens. I will give him this: he does seem to be a very nice guy, being the only player who came over and said hello before the game. But that's not going to get him back in the NBA. The points leader for the night was Mario West, who was recently acquired by the Claws after the NBA's Atlanta Hawks sent him packing. While his NBA stats over the past two years aren't impressive, his 19 points in 25 minutes last night suggest that he's going to be a leader for the Claws. Clearly he was a good pick-up for Maine. The Claws' other addition from the NBA, Trey Gilder, wasn't quite as impressive, but he certainly had his moments. Celtic Bill Walker had a decent, though not outstanding, night. He's clearly much more a part of the team now, but even though he spent the most time on the court he tied for second in points (14) and didn't make much of a dent in the other statistical categories. Walker had a much better game in last Friday's away loss to Sioux Falls, but then again, so did team captain and veteran player Billy Thomas. Last night the stars were Mario West and Tony Bobbitt, but the Red Claws were quite balanced, with almost every player on the roster getting in for at least twenty minutes and only one with more than thirty (Walker). This stands in stark contrast to the Springfield Armor, who had three players in for most of the game. The refereeing, while relatively poor, at least doesn't have the kind of ridiculous favoritism at the D-League level as in the NBA. I will say that one of the interesting points about sitting courtside is getting a good picture of when the coach is upset about calls, and mostly every time I was pissed at the refs Austin was as well. This is going to be a good season, and I have no doubt that several of the players signed by the Red Claws will get second looks from NBA teams as their season wears on. The Claws looked very good for the most part last night, with only a few gaping holes as a team. For example I think Austin will be running a few 3-point drills this week - they only had one all night. Still, for the very start of the season the Red Claws looked good. I expect they'll be a competitive team this year for sure. UPDATE: The Red Claws thrashed the Armor again Saturday night 115-89, this time in Springfield, improving to 3-1 while the Armor fell to 0-4.